Uttar Pradesh Police Recruitment and Promotion Board (UPPRPB) has released the Notification for the Recruitment of Constable. There are huge vacancy of 41520 posts for Constable. The exam is offline mode. The Written Exam was conducted on 18th and 19th June 2018. There was also many news regarding the cheating and leakage of exam. So due to this reason it comes in news that Written Exam will be cancelled. 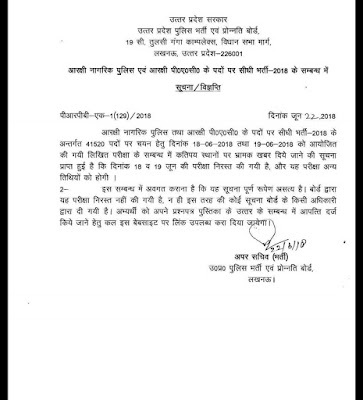 on 22nd of June 2018 by the official Authority it came in news that it UP Police Constable exam cancelled and Re Exam Date for UP Police Constable Written Test 2018 will be 14th and 15th july. It is also said that UP Police Constable offline written re-exam scheduled to 14.07.2018 & 15.07.2018. The centre for UP Police Exam Center - held at the different centres across the Uttar Pradesh state. 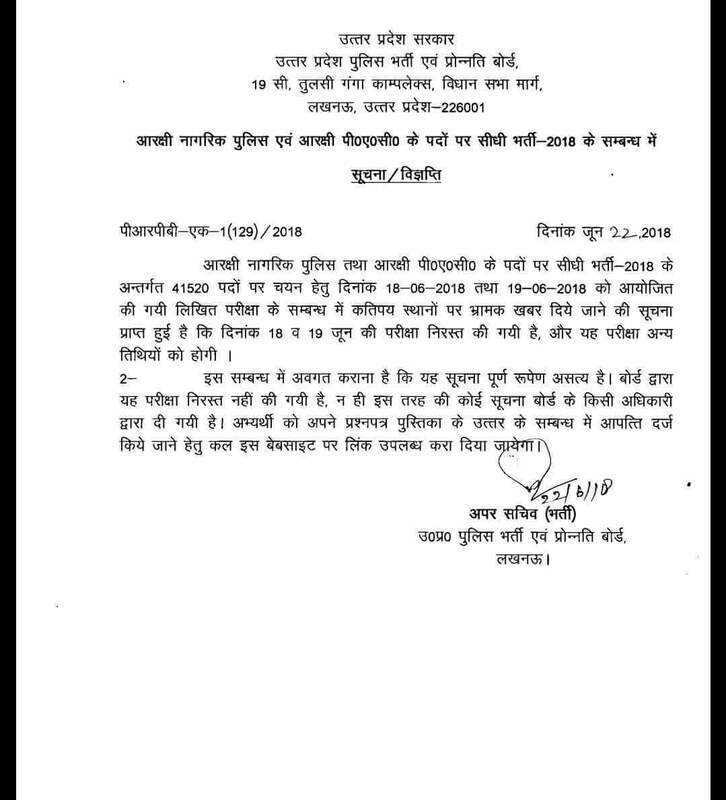 Many website also tell the UP Police Re Exam Admit Card will be available in month of July 2018, 5 days before the exam. Though it is not official announcement but soon it will available in official website. But here I would like to make it clear that it's completely fake news. There is not any official announcement that UP Police Exam will be cancelled. Though there were some suspicious activity during exam and police also arrested some people regarding this but exam is cancelled it's totally fake and rumours spread among tha student. Don't pay attention toward fake news. 27 people were arrested for allegedly aiding cheating through hi-tech devices such as spy-mics, and placing "solvers" impersonating the aspirants, officials said. The Uttar Pradesh Special Task Force (STF) today arrested 22 people in Meerut, IG STF Amitabh Yash told PTI, taking the total number of arrests during the two-day exam.